Therefore, I absolutely loved The Trouble with Cowboys! Not only was it a well-written love story featuring a cowboy and a "damsel in distress" but it was a book based on God, faith, and the promise that God has very special plans for our lives, even if we can't see it right at this very moment. This was a great reminder for me in my life right now as I just moved to a new state, started over with my family, and wait on the Lord for when he sees fit for someone to buy our house! I was reminded that God has a plan and it is so much better and more wise than mine! This book had me reading it whenever I could, even when I was too tired or stressed to even think..this book was a welcome refuge and I loved every word of it! 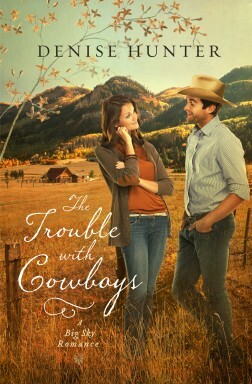 If you love romantic cowboys like I do, definitely get Trouble with Cowboys for yourself today! Buy It: You can purchase Trouble with Cowboys for $12.99 from Thomas Nelson.